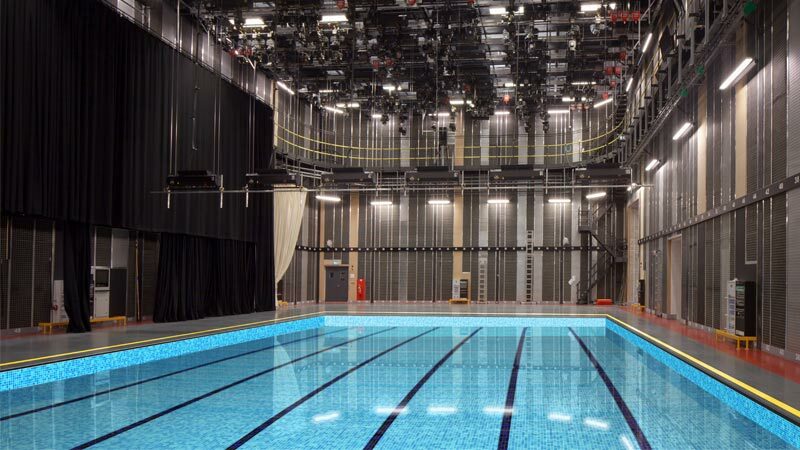 dock10, the UK's leading television facility, has today announced it is to open an Olympic-size swimming pool beneath its flagship studio, HQ1. The Olympic short course size pool is 25 metres (27.34 yards) in length and formed part of the original build of the studios in 2010. The feature has recently been completed with new water pumps connected to the Manchester Ship Canal that runs parallel to The Studios. A motorised retractable floor reveals the pool with a simple 'open and close' switch in the corner of the studio. Andy Waters, Head of Studios, at dock10, said: "We are very excited to offer this new feature. Having a swimming pool under our flagship studio will be really attractive to our customers, from live swimming events to after-show parties. It's based on the gym-court design that is popular in the USA, a bit like in the movie 'It's a Wonderful Life' but more like something out of 'Thunderbirds.' It's taken a long time to complete the project as the movable floor and water systems have been a major installation, but I'm really looking forward to showing it working. Clearly, we have to be careful with our safety procedures as you don't want to accidentally switch it on in the middle of a production, which is why we have a permanent life-guard stationed next to the switch." Patrick Steel, Head of Commercial, at dock10, said: "This new capability opens up a world of opportunities for programme makers. Along with the obvious swimming shows we are also looking at scuba diving, ice skating, fishing and maybe even ice fishing. As HQ1 is 15m / 49ft in height, we could host events like the Manchester Boat Show Live as the pool will easily accommodate a 25m boat with a 15m mast. The boats could arrive on the Manchester Ship Canal and be transferred directly into the studio by hoist. We would also love to see a reimagined version of the television classic ‘Bullseye,’ where the winners of the star-prize speedboat can actually sail off at the end." Final work will begin in April, installing a slide and diving board from the studio gantry. The swimming pool is expected to be ready for use by summer 2019, and the team is already taking advanced bookings.